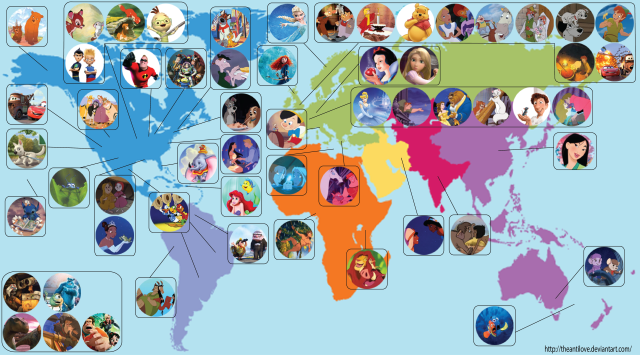 Digital artist Eowyn Smith has created a map of the world highlighting the location of animated films by Disney and Pixar. The fan art maps 44 Disney animated films 13 Pixar films. It reaches as far back as Disney’s first film, Snow White, and includes Disney’s 2013 release Frozen. In traditional cartography fashion, Wall-E, Monsters, Inc., Dinosaur, Treasure Planet, and Wreck-It Ralph are given an inset. The films are variously set in the future, prehistoric past, or alternate universes. 2. If the movie was too vague to determine a location, the original story/myth was consulted.